The 1999 NRL Grand Final was the conclusive and premiership-deciding game of the 1999 NRL season. It was contested by the competition's two newest clubs: the Melbourne Storm, competing in only its second year (having finished the regular season in 3rd place); and the St. George Illawarra Dragons, in their first year as a joint-venture club (having finished the regular season in 6th place), after both sides eliminated the rest of the top eight during the finals. A new rugby league world record crowd of 107,999 was at Stadium Australia for the game. The attendance, which saw 67,142 more people attend than had done so for the 1998 NRL Grand Final at the Sydney Football Stadium, broke the record attendance for a Grand Final, eclipsing the previous record of 78,065 set in 1965 when St. George defeated South Sydney 12-8 at the Sydney Cricket Ground. Pre-match entertainment featured Hugh Jackman's rendition of the Australian national anthem. The 1999 NRL season was the 92nd season of professional rugby league football in Australia, and the second to be run by the National Rugby League. With the exclusion of the Adelaide Rams and Gold Coast Chargers, and the merger of the St. George Dragons and Illawarra Steelers, seventeen teams competed for the NRL Premiership during the 1999 season, which culminated in the first grand final to be played at Stadium Australia. The 1999 Melbourne Storm season was the second in the club's history. Coached by Chris Anderson and captained by Glenn Lazarus, they competed in the NRL's 1999 Telstra Premiership, finishing the regular season in 3rd (out of 17). The 1999 St. George Illawarra Dragons season was the first in the newly formed joint-venture club's history. Coached by David Waite and Andrew Farrar, and captained by Paul McGregor, they competed in the NRL's 1999 Telstra Premiership, finishing the regular season in 6th place (out of 17). The Dragons were up 14-0 at half time, with a converted try and penalty goal to Craig Fitzgibbon, and a converted try to Nathan Blacklock. However, an Anthony Mundine knock-on over the try line early in the second half proved to be a major turning point in the match, with Melbourne running in tries through Tony Martin and Ben Roarty and winger Craig Smith kicking two penalty goals. An unconverted try to Dragons captain Paul McGregor couldn't stem Melbourne's momentum, with Craig Smith kicking the Storm to within four points of the Dragons at 18-14. In the 77th minute the Storm forced the Dragons to a goal line dropout. Melbourne's halfback Brett Kimmorley then bombed to Craig Smith's wing. Dragons centre Jamie Ainscough, anticipating a Melbourne try, caught Smith in a head-high tackle over the try-line, resulting in Smith being knocked unconscious and, in the process of falling to the ground, Smith knocking on. Referee Bill Harrigan requested video referee Chris Ward adjudicate on the decision. The Melbourne Storm were granted a penalty try, drawing them level with the Dragons. Being a penalty try, the subsequent conversion was taken from directly in front of the posts. Matt Geyer was successful in the conversion and the Storm, for the first time in the match, pulled ahead of the Dragons and took out their first grand final 20-18. The Storm thus became the quickest expansion team to win a premiership, eclipsing the Canterbury side who won the 1938 premiership in just their fourth season. It was the last game of champion prop and captain Glenn Lazarus, who retired after a remarkable fifth grand final victory (having won premierships with the Canberra Raiders in 1989 and 1990 and with the Brisbane Broncos in 1992 and 1993). For traditional St George fans the loss was hard to take. The Dragons were unsuccessful in their four previous visits to the grand final (1985, 1992, 1993 and 1996) and had not won a premiership since 1979. The grand final attracted a television viewership of over 600,000 in Melbourne, a traditional Australian Rules football stronghold. ^ The consequences of a later, similar, head-high tackle would eventually cost Ainscough his career (see Gleeson, Martin, "On this Day: 26 August 2002: Wigan player has tooth removed - from arm", The Guardian.com, 22 August 2009). ^ Prichard, Greg (19 September 2012). "Ward given keys to make right call". The Sydney Morning Herald. Retrieved 19 September 2012. ^ "1999 NRL Grand Final". rugbyleagueproject.org. Shawn Dollin, Andrew Ferguson and Bill Bates. Retrieved 15 June 2016. ^ Cockerill, Ian (3 October 1999). "Eye of the Storm". The Sunday Age. p. 4. Retrieved 6 October 2009. The Melbourne Storm are a rugby league team based in Melbourne, Victoria in Australia, that participate in the National Rugby League. The first fully professional rugby league team based in the state, the Storm entered the competition in 1998. 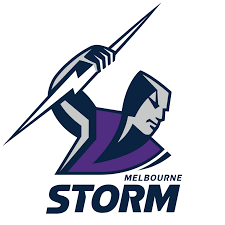 The Storm were originally a Super League initiative, created in 1997 during the Super League war, however, following the Super League collapse, the team became a part of the newly formed, united competition. The club play their home games at AAMI Park. The Storm have won three premierships since their inception, in 1999, 2012 and 2017, have contested several more grand finals and were stripped of the 2007 and 2009 premierships, following salary cap breaches. The Storm also competed in the NRL's Under-20s competition from 2008 until its demise in 2017 and now in 2018 have entered the in the Hastings Deering Colts u20s QLD competition. In addition, the club has also expanded into netball with a joint venture with University of the Sunshine Coast. The Sunshine Coast Lightning commenced playing in the National Netball League in 2017. The St. George Illawarra Dragons are an Australian professional rugby league football club, representing both the Illawarra and St. George regions of New South Wales. The club has competed in the National Rugby League since 1999 after a joint-venture was formed between the St. George Dragons and the Illawarra Steelers. They officially formed as the game's first joint-venture club on 23 September 1998 and remain the only cross-city team in the NRL. The team has its headquarters and leagues clubs in both Wollongong and the Sydney suburb of Kogarah, and train and play games regularly at WIN Stadium in Wollongong, as well as at Jubilee Oval in Kogarah. From 2006 to 2018 the club was jointly owned by the St. George Dragons 50%, Illawarra Steelers 25% and WIN Corporation 25%. In August 2018 WIN Corporation purchased the Illawarra Steelers remaining 25% stake. Jamie Ainscough is an Australian former professional rugby league footballer of the 1990s and 2000s. An Australia international and New South Wales State of Origin representative three-quarter back, he played his club football for the Western Suburbs Magpies, the Newcastle Knights, the St. George Illawarra Dragons and the Wigan Warriors. The 2007 NRL season was the one hundredth season of professional rugby league football club competition in Australia, and the tenth run by the National Rugby League. Sixteen teams contested the NRL's 2007 Telstra Premiership, and with the inclusion of a new team, the Gold Coast Titans, the competition was the largest run since the 1999 NRL season. The 2006 Brisbane Broncos season was the nineteenth in the club's history. Coached by Wayne Bennett and captained by Darren Lockyer, they won the NRL's 2006 Telstra Premiership, finishing the regular season in 3rd place before going on to defeat the first-placed Melbourne Storm in the 2006 NRL Grand Final. The 2008 NRL season was the 101st season of professional rugby league club competition in Australia, and the eleventh run by the National Rugby League. For the second year, sixteen teams competed for the 2008 Telstra Premiership title. The season commenced with the first matches played on 14 March and ended with the Grand Final, played on 5 October. The premiership was won by the Manly Warringah Sea Eagles who set the record for the highest Grand Final victory in Australia's rugby league history. Jeremy Smith is a New Zealand former professional rugby league footballer. A New Zealand national representative, he plays at lock and second-row. He played for the Melbourne Storm, with whom he won the 2007 NRL Grand Final with, the St. George Illawarra Dragons, with whom he won the 2010 NRL Grand Final with, the Cronulla-Sutherland Sharks and the Newcastle Knights, who he co-captained, in the National Rugby League. The 2009 NRL Grand Final was the conclusive and premiership-deciding game of the NRL's 2009 Telstra Premiership season. Played on 4 October 2009 at Sydney's ANZ Stadium was contested between the Parramatta Eels and the Melbourne Storm, the latter competing in their 4th grand final in a row. It was also the first Grand Final to feature the two referee system, with Shayne Hayne and Tony Archer being the first referees to jointly officiate in an NRL Grand Final. The 2010 NRL Grand Final was the conclusive and premiership-deciding game of the 2010 NRL season. Played on Sunday, 3 October at Sydney's ANZ Stadium, the match was contested by the St. George Illawarra Dragons and the Sydney Roosters. It was the first time the two sides met in a grand final. They had played each other twice before during the season, with St. George Illawarra winning on both occasions. The Dragons finished the season as minor premiers as they had the previous season. The Roosters were the previous year's wooden-spooners and only after playing and winning for five consecutive weeks were able to reach the 2010 decider. The 2006 NRL Grand Final was the conclusive and premiership-deciding match of the NRL's 2006 Telstra Premiership season. It was played between the first-placed Melbourne Storm and the third-placed Brisbane Broncos clubs on the night of Sunday, 1 October. The 2006 grand final was the first ever to feature teams which were both from cities outside the borders of New South Wales, in this case the capitals of Queensland and Victoria, yet was played at Sydney's Telstra Stadium. It was the first time the two sides had met in a grand final. They had played each other twice during the 2006 regular season, with Melbourne winning both times. The Storm went into the grand final as favourites, having won the minor premiership. Both teams were looking to keep their perfect grand final records intact: the Broncos with 5/5 and the Storm with 1/1 heading into the game.